I have had to train myself to harvest pine needles which feels a bit strange but makes sense: When you grow up with a garden and a tomato harvest every August, you don’t have to train yourself that August is tomato month and that you will be very busy slicing and blanching. Who grows up harvesting pine needles in the spring? To eat? My boys now do but I sure didn’t. The training sort of feels more necessary because, for goodness sake, a pine tree has needles year-round. It doesn’t seem like a seasonal crop at all. However, the flavor from the new growth needles in the spring is head-and-shoulders above the mature needle. It’s almost a different flavor. The flavor of the needle in the spring is brighter and it is more concentrated. With a flavor that is as delicate as pine, you need that extra flavor concentration and brightness to make this vinegar work. Otherwise, your final product will be lackluster. In addition, because you are working with a delicate flavor, I recommend a white wine vinegar or your favorite mild-flavored vinegar. Apple cider vinegar is a bit heavy for this recipe. It’s great in a lot of ways but that distinct pine flavor is not showcased as it ought to be. This recipe is simple but it requires advanced planning since it will sit in your pantry steeping for a month or more. 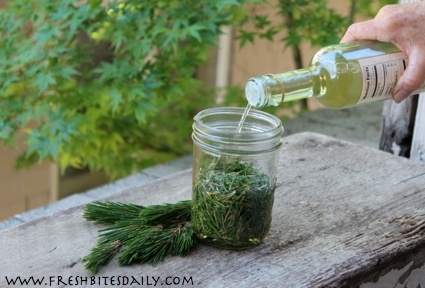 You do want to allow it time for the pine flavor to infuse in the vinegar. Time will create an exceptionally flavored vinegar for you. I actually let mine sit for months. Spring and summer bring so many bright flavors that this is one I am usually looking for around November. You can certainly let your needles sit that long before straining them. Add vinegar until the vinegar covers the needles by about one inch. Secure with a tight-fitting lid. Swish the ingredients and store in a cool, dark place. Swish the ingredients daily or as often as you notice them. Let the mixture sit for a month or longer. Strain off the needles and retain the vinegar. Store the vinegar in a cool pantry. This will be a fun ingredient for you to have around. Of course you will need to make a basic vinaigrette salad dressing with it to experience its basic flavor. Keep it in mind when you have a basic sauce or marinade that requires vinegar. 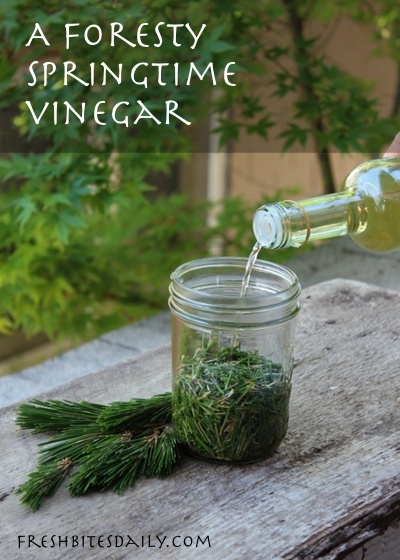 You pine needle vinegar could add a new dimension to that recipe.